Loscoe State Opera at Stainsby Festival. Every Stainsby Festival has its special times - and this year’s was pure gold. On the festival’s 50th anniversary, Loscoe State Opera played their final gig and stole the show. There were no farewell speeches, just a band determined to go out with all guns blazing and give their fans a night to remember. Regulars at Stainsby for the past 14 years, the band gathered in a big crowd to bounce its way through the show. Kicking off with Midsummer’s Day, the eight-strong folk-roots combo tore through their back catalogue including Pretty Story, Step Out Mary and the surprisingly poppy World Goes Round. After the main set, the band with tradition at the festival when they exited the stage for the first time - only to be cheered back on by an ecstatic crowd. This final fling really showed Loscoe State Opera at their best in a fitting headline spot. 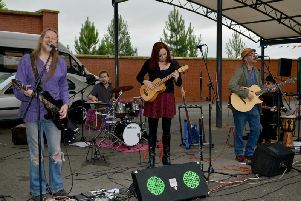 The supremely skilled singer/guitarist George Borowski, accompanied by his equally talented daughter Mora on vocals and a backing bass guitarist, proved a worthy support act. The trio was playing its third festival of the day but put as much energy and passion into their performance as if it was the first. A great mix of songs had the audience bopping along to Jump Jive and swaying and singing along to a country-infused The Blue Guitars of Texas. Teaming up the first time in public, the exquisite chanteuses Judy Dunlp and Edwina Hayes got Saturday night off to a great start. Most of their performance was a tag team effort, one singing while the other sat down but all numbers were sung beautifully as Edwina and Judy accompanied themselves on guitar or ukekele. Judy adapted one song by Steve Knightley to reference the dozen pits in the area which had closed. Edwina amused the audience with a quirky song called Waiting For The Guy To Die. The songs were interspersed with Judy’s jokes and Edwina’s anecdotes about her family. Song for Auntie Brenda was among a couple of numbers which the pair performed together...hopefully they will feed more duets into the act as their collaboration builds.